As an Electrical and Electronics engineer with specialty in Communication as applied to satellites from Cape Peninsula University of Technology in South Africa, Manfred Quarshie has organized successfully series of workshops on Space and Satellite Technology which brought stake holders on the need for Ghana to start to go into Space technology. 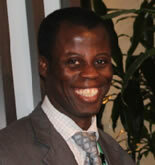 Currently the Director of All Nations University Space and Satellite Program in Ghana. In terms of projects, currently working on an amateur Satellite Ground Station by the end of 2013 and by the end of 2016 build and launch Ghana's first Earth Observational Satellite.